The same three candidates are standing again, but given the usual swings since then, it’s almost inconceivable that Ken Macintosh should win the seat this time — not least because he probably only won because many supporters of other parties voted for him to keep the Tory out. If the only thing that happens is that Yes-voting Labour votes swing to the SNP, Stewart Maxwell should win easily. However, the Tories have been pushing the message hard that only they can beat the SNP, and if they manage to convince enough former Labour voters, it’s quite possible Jackson Carlaw will win the seat. It’s therefore extremely important that Stewart gets as many votes as possible. This is also true for any remaining Tory-hating Labour voters — the only person who can keep the Tories out is Stewart Maxwell. Because the Tories have a real chance to beat the SNP in the constituency, it’s much more important to vote SNP on the list than in many other regions. In most regions it’s looking like the SNP will take all the constituency seats, which makes it difficult (albeit not impossible) to gain any additional list seats; however, in the three regions West Scotland, South Scotland and Highland & Islands there’s a real risk the other parties will win some constituency seats, and the SNP might thus need list seats here in order to achieve a majority in the next Scottish Parliament. I have some sympathy for tactical voters in the other regions, but in these three regions it’s really important to give both votes to the SNP to ensure that we get another pro-independence majority. The Unionists would love to unseat Stewart Maxwell tomorrow. If Jackson Carlaw wins the constituency and if enough SNP voters vote Green or RISE on the list because they think it doesn’t matter, then that could really happen, which would be a real shame. Not only would the Unionist press have a field day if Stewart didn’t get reelected, but the Scottish Parliament would also have lost one of its best MSPs. 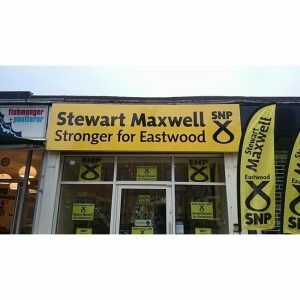 Please vote for Stewart Maxwell if you list in Eastwood, and please give your list vote to the SNP if you live in the West Scotland region!